Since weather prevented us from making it to the Museum of the Rockies, last weekend, we decided to stop by the toy store, to pick up a 3D Tyrannosaurus Rex model (B.C. 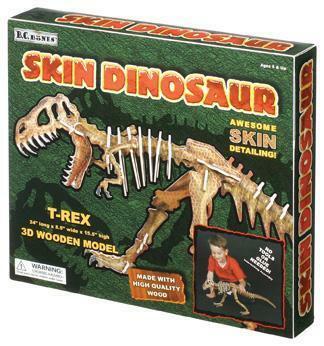 Bones Skin Dinosaur T-Rex, by Toysmith, to be exact), in an effort to bring the museum, or at least the museum gift shop to us. The puzzle was fairly reasonably priced, as far as "educational" toys go. I think you can find them online for between eight and twelve dollars. The pieces are wooden, laminated with a dinosaurish skin sort of design. So, the put together dinosaur still has a skeleton look, but is not too creepy for younger children to want in their rooms. Some of the pieces fit too loosely to stay together, so we glued them, according to the instructions, with school glue. The model stays together now, but that does mean we won't be able to take it apart, and put it back together again. That, however is just as well, as my one "bone" of contention with the kit, is the extremely difficult to follow instructions. According to the box the model is for ages five, and up, but there is no way a five year old could put it together. My youngest four (ages 4-10) started out putting it together. When they ran into trouble, my oldest (age 13) joined them. Finally, they turned it over to the Man of the House, who after much mumbling to himself, and quite a bit of griping about unreadable directions, deciphered the code, and managed to assemble the dinosaur. We decided the box really should say ages 12 and up. But then, it's not a realistic skeleton, just a cool looking model, and I would think by 12, if a child is still interested in dinosaurs, they might want a more scientifically correct model. So, I have a mixed review. We probably won't buy another one of these. But, the one we have, makes a very nice centerpiece, for our dino-week. I remember picking up a kit like this for my son, it never did get put together. At least it looks cool. How frustrating though. I'm surprised you even purchased a kit. You're so creative, you can probably make a better one out of found materials! That's a shame it didn't put together well. You hit the nail on the head for why I haven't bought one for my kids yet, I've been afraid they would be too hard.